Posted on Tue, Sep 22, 2009 : 6:36 p.m.
Eso Akunne and his father walked into John Beilein’s office two weeks ago unsure what to expect. They knew the meeting with the Michigan men’s basketball coach had to do with whether or not Akunne would be on scholarship this year. They expected the worst. What they got was a free education for a year. 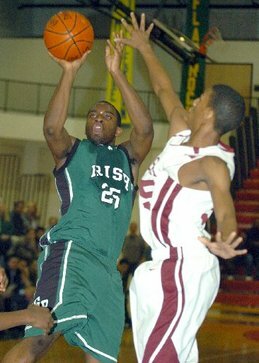 Eso Akunne, a Greenhills High School graduate, averaged 17 points and 10.9 rebounds per game in high school. “I couldn’t believe he did it,” Akunne said. “But at the same time, my facial expression wasn’t like ‘Oh, my gosh.’ I was shocked. Instead, Akunne was on scholarship as his first semester at Michigan began earlier this month. The scholarship, which is good for one year, was officially announced last week. Michigan, though, was always the preferred destination for the hometown kid from Gabriel Richard High School. He had offers from most of the Mid-American Conference, Oakland out of the Summit League and began to receive some interest - but no scholarships - from Kansas and Louisville, among others, by the end of his senior season. So the 6-foot-3, 220-pound guard who played all five positions at times for Gabriel Richard had a choice. Wait on the other schools, which might not come through with a scholarship offer, or go to Michigan as a preferred walk-on, play in front of his hometown fans and put himself in position to earn a scholarship. Plus, there’s something else - the chance to continue his hometown legend after averaging 17 points, 10.9 rebounds, 5.9 assists and 1.6 blocks in his career. Akunne played consistently for Gabriel Richard. And he’s already had to explain to friends and fans clamoring for tickets that it won’t be the same. He said Beilein has a role for him this season, but it won’t be playing every minute. Not with Manny Harris and a plethora of guards playing in front of him. That, though, is a good problem for Akunne to have, especially now that he’s on scholarship. Michael Rothstein covers University of Michigan basketball for AnnArbor.com. He can be reached at (734) 623-2558, by e-mail at michaelrothstein@annarbor.com or follow on Twitter @mikerothstein. Sun, Sep 27, 2009 : 9:27 a.m.
Hey, how about cross checking the name under the picture with the name of the school in the article? Eso attended and graduated from Father Gabriel Richard High School. He is very proud of that and the students are FGR are very proud of him. Congrats Eso for all your hard work! Thu, Sep 24, 2009 : 9:40 a.m. I think Akunne is going to surprise A LOT of people before he's done at U-M. He's an extremely versatile player who also has the desire to compete at the Big Ten basketball level. I'm excited both for him and U-M. Wed, Sep 23, 2009 : 6:44 a.m.
A2, You're right. This did happen two weeks ago and AnnArbor.com broke the story then. However, this was the first interview Akunne had done since receiving his scholarship and considering he's from Ann Arbor, that seemed worth reporting on. Tue, Sep 22, 2009 : 10:17 p.m.
Tue, Sep 22, 2009 : 8:43 p.m. If you're tough, athletic, and your shot falls, JB can find a place for you in his offense. Akunne looks like he has all three of those qualities. Congratulations, belated as they may be, to Eso Akunne.